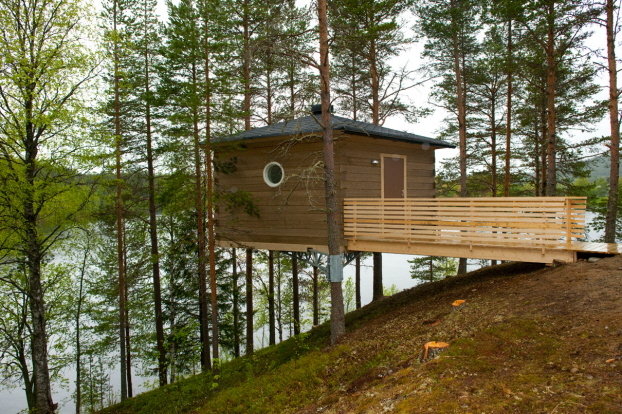 Experience an unforgettable memory and sleep up amongst the treetops in a treehouse or on a raft on River Klarälven. Stay in a tree stump or a pirate village. Try wilderness camping without electricity or glamping with a cut-glass chandelier in the tent. Here, we have put together some unusual, fun or simply wonderful accommodation to experience on campsites around Sweden. 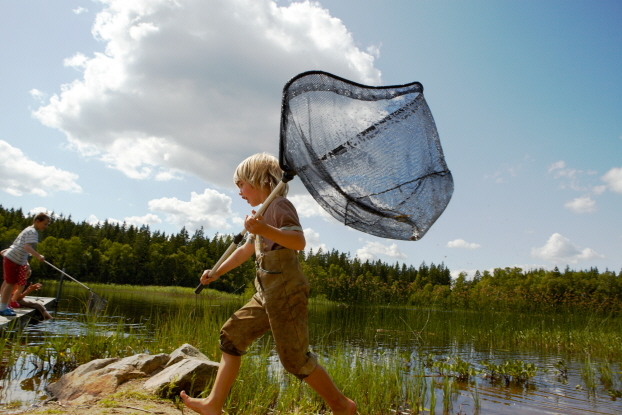 At Hätteboda Vildmarkscamping in Urshult, Småland, you can experience wilderness life. Here you can fish, swim, paddle a canoe, walk in the forest and have a real wilderness experience – there isn’t even electricity on the site. 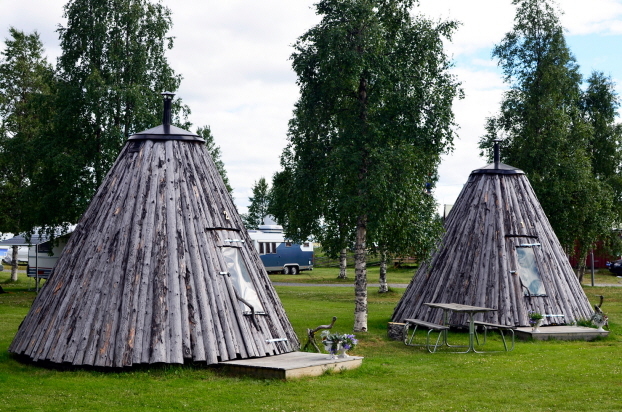 Saiva Camping in Villhelmina, Lapland, is beautifully located by the shore of Lake Baksjön. The campsite offers unusual accommodation in its 2 modern Lapp cots with 2 beds, a wood-burning stove and fridge. WC, shower and a fully equipped kitchen are available in the service building near the Lapp cots. Try glamping at Storängens Camping, Stugor & Outdoor in the heart of Värmland where you can stay in a very spacious, luxury Tendi Safari Lodge Tent with beautiful views over River Klarälven. When you’re not relaxing and enjoying the peace and quiet in your luxury tent, you can fish or go on a beaver safari. Live like a pirate on the West Coast in Piratbyn (The Pirate Village) by the sea at Daftö Camping Resort in Strömstad, Bohuslän. If you would like more adventurous accommodation, you can stay in a treehouse accessed via suspension bridges. 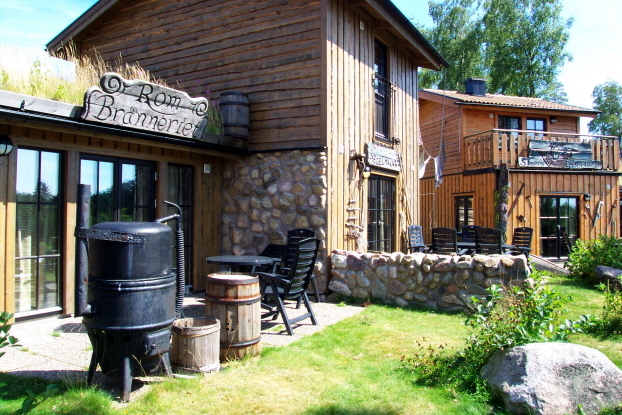 There is also a restaurant in a Bohuslän pirate setting and our own amusement park – Daftöland. The small village of Granö in Västerbotten is an old Sami meeting place and the door to Lapland. Here in one of Europe’s last wilderness regions you’ll find Granö Beckasin, where you can go to find inner peace. Here you can feel free as a bird and stay in a bird’s nest high up in a pine tree in the height of comfort! There is underfloor heating, a shower and toilet, small kitchenette and espresso maker. 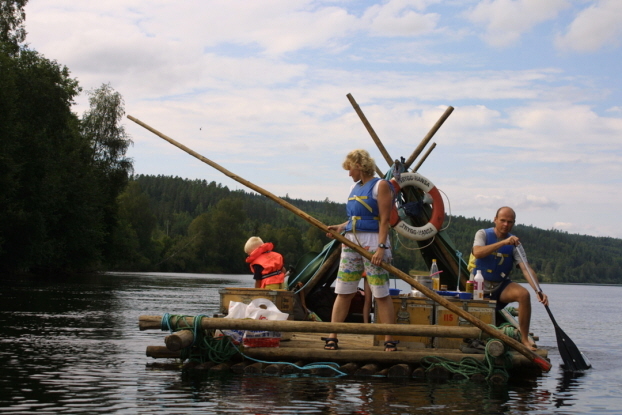 Build your own log raft at Klarälvens Camping with Vildmark i Värmland, and then slowly float along River Klarälven and set up camp for the night wherever you fancy. Choose your own day stages or build a raft that is ‘all-inclusive’ with pre-arranged sleeping places and served-up dinners along the way. 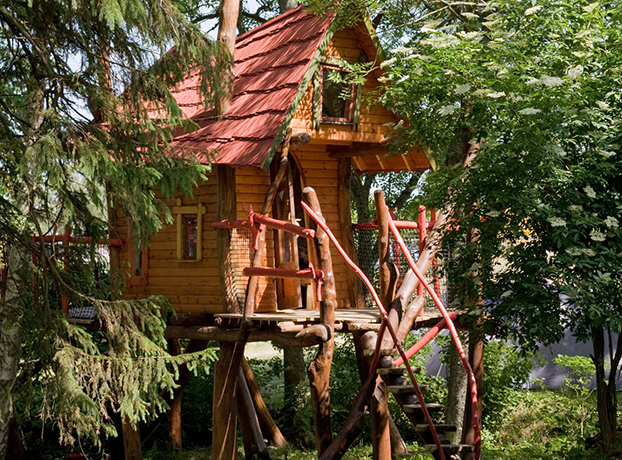 Let your childhood dream come true and stay in a treehouse in Kneippbyn Resort Visby on Gotland. Here you will have an outlet for all your energy with games and swimming, and then you can sleep well after the day’s fun in your own treehouse among the treetops. Don’t forget to visit Pippi Longstocking in the original house from the Pippi Longstocking films. 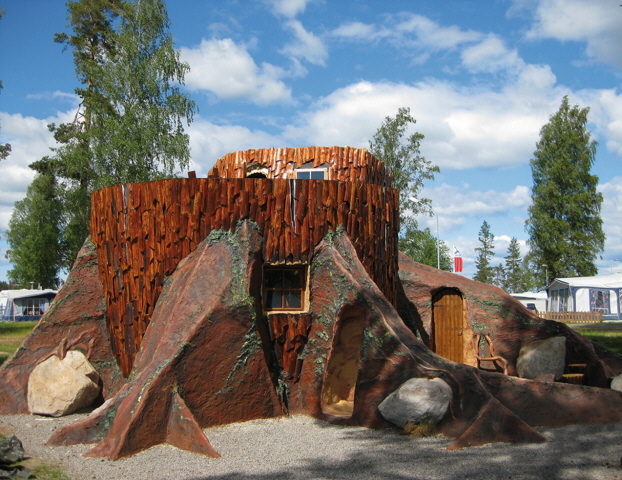 At Karlsborgs Camping in Västergötland you can stay in a real tree stump. There are two nice tree stumps with the best views of Lake Vättern. They are fully equipped with beds, a kitchenette, shower, WC and furnished patio. The biggest tree stump is 5160 years old, and the tree that stood on the stump was 310 m high when it was felled.